Jared Goff Is Not An Elite Signal Caller Worth Trading Up To The Top Of The Draft. But He Has The Potential To Be A Top 15 QB, So He’s A Quarterback that the Eagles Should Target. Compile a greatest hits tape of Jared Goff’s 2015 season, and you’d see a blue chip prospect destined for greatness: his accuracy, deft touch on deep passes, functional mobility in the pocket and ability to manipulate defenders with his eyes are truly sights to behold. But if you dig a little deeper in the tape, the warts start to emerge: his inconsistent mechanics, head-scratching interceptions, and odd habit of miss-firing on open receivers should give any franchise pause for concern. Bottom line: Goff has all of the tools you want in a quarterback: the accuracy, vision, work ethic, intelligence; and if he gets under the right coach in the right scheme, he could become an elite quarterback. But odds are he won’t ever reach that ceiling. He is too inconsistent to be considered an elite prospect or project as an elite signal caller. The safer bet is that Goff turns into a top 15 quarterback in the league, which, as we have discussed before, is what you need to realistically compete for a Super Bowl. So while I wouldn’t mortgage the future to trade up to the top of the draft to get Goff — cough, St. Louis, cough — I would strongly consider making a move if he slips out of the top four picks. Let’s break this down by the numbers and game tape. But as you know, raw numbers in college can be misleading. That is especially true with completion percentage, where even middling prospects can put up gaudy numbers by completing a high percentage of passes within 10 yards of the line of scrimmage and feasting on the weaker opponents on their schedule. A better way to judge how a quarterback’s accuracy translates to the NFL is to break his throws down by distance and location on the field. This shows whether a quarterback is able to complete “NFL type throws” — i.e., those beyond 10 yards and outside the numbers. As you can see, Goff has strong numbers on deep and intermediate throws. On deep throws, Goff completes 53, 75 and 48 percent of his passes. We also see that these high numbers aren’t the result of small sample sizes: Goff attempted 88 passes that traveled beyond 20 yards. That represents 17% of his passes on the year. Goff also performed well in the mid-range throws, completing 78, 69 and 62 percent of his passes, respectively. 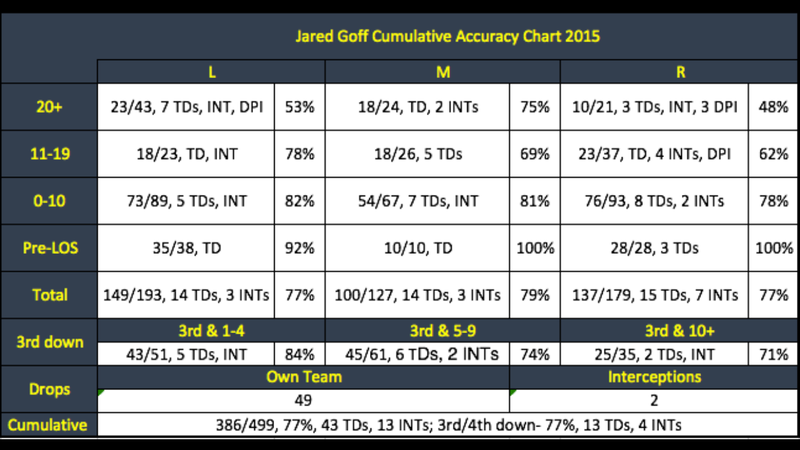 When we combine Goff’s throws of 11+ yards, we see an impressive total: 110/174, 63%,18 touchdowns, 9 interceptions. These numbers suggest that Goff won’t struggle with the transition to the NFL. Spend a few hours googling scouting reports on Goff and you will come away with a broad range of quarterback comps: from Aaron Rodgers to Matt Ryan to Brian Hoyer and Jake Locker. (Hint, the hyperlink takes you to each report). So I thought it would be helpful to compare Goff’s 2015 season to some of his contemporaries. Static will always exist with these types of comparisons, since each quarterback played on teams with varying talent levels and against different quality of opponents. But the numbers still give us some baseline from which to draw accurate comparisons. Here is how Goff’s last season in college compares to the same seasons for Andrew Luck, Marcus Mariota, Jameis Winston, Jake Locker, Blaine Gabbert, and Matt Ryan. Goff’s TD/INT ratio is obviously impressive, but so to are his yards per attempt and adjusted yards per attempt. His numbers are behind only Marcus Mariota, but ahead of everyone else — including Andrew Luck. That’s important because it reaffirms that Goff wasn’t dinking and dunking his way to gaudy numbers like, perhaps, Blaine Gabbert or Jake Locker. And from a big picture perspective, these numbers suggest that Goff is more Luck/Winston/Mariota than he is Gabbert/Locker. But I’m hesitant to put him on the level of Luck, Winston and Mariota because of some of the inconsistencies that I alluded to earlier. Against Utah, Goff went 25/47 for 340 yards, 2 touchdowns and 5 interceptions. Against Oregon, Goff threw for 329 yards and 2 touchdowns, but he only completed 43.9% of his passes and threw an interception. Luck’s season was more consistent in that regard — while he did not have any 5+ touchdown/0 int performances like Goff had against Air Force and Arizona State — he didn’t have the ugly games like Utah on his schedule either. Indeed, Luck did not have any game in which he: (1) completed less than 60% of his passes or (2) threw more interceptions than touchdowns. Philadelphia’s favorite adopted son, Marcus Mariota, only had one. From a statistical standpoint, these numbers suggest that the Locker and Gabbert comps are off-base. Goff likely rests just below Luck, Mariota and Winston; a projection I am comfortable making because it is backed up by the film. Goff’s game tape matches his numbers, filled with some “WOW” throws followed by some head scratchers. As a full disclosure, I watched the following game tape of Goff for this scouting report: ASU, Airforce, Utah, USC, Stanford, San Diego State and Texas. Here is a quick chart breaking down his strengths and weaknesses, with analysis and game tape that follows. Goff excels in the short to intermediate passing game, with precise ball placement on slants, hooks, and quick outs. The tape is filled with countless examples of Goff hitting receivers in stride, enabling them to gain yards after the catch. As we saw above, Goff excels with deep passing, especially on loft passes outside the numbers and up the seam. But I’ll take the compliment a step further: Goff is the best deep ball thrower in this class, and one of the better deep ball throwers to come along in recent memory. It was almost impossible for me to narrow this list down — he seemed to complete at least 2-3 great deep balls per game. For those of you counting at home, that’s a 60 yard pass hitting a receiver perfectly in stride. Goff released this ball right before he got hit — another thing in which he excels — and his receiver did not have to adjust his arms or slow down to make the catch. As you can see, Goff’s accuracy and timing on deep throws is impressive. As we saw last year with Sam Bradford, when a quarterback refuses — or simply can’t — attack a defense deep it clogs up the offense. The defense jams wide receivers at the line without fear of the deep ball. NFL defenses will be hard pressed to do that against Goff; he consistently shows the ability to deliver the ball accurately and with good timing. One of the more underrated skills in a quarterback is the ability to navigate the pocket while keeping your eyes down the field. Too often we see quarterbacks who drop their heads when they sense pressure, or worse, take off before they let a play develop. Goff does not have that issue, and next to his deep passing, this is probably the area in which Goff excels the most. Watch as Goff scans to his right, senses the pressure coming, spins away and still has the wherewithal to get to his next read on the opposite side of the field. For the curious minds, Goff ends up completing the pass for a first down. Watch his head closely; outside of when the defender almost tackles him to the ground, he never lowers his eyes to see the pressure. He consistently looks down field for the open receiver despite having defenders swarming all around him. That is some Aaron Rodgers/Big Ben/Tony Romo-esque maneuvers in the pocket. Another area that Goff excels is his ability to manipulate defenders with his eyes and by using pump fakes. There are NFL quarterbacks who have not mastered this skill — cough, Geno Smith — cough, but Goff has shown no aversion to doing this at the collegiate level. This angle doesn’t let you appreciate how Goff holds the safety on the opposite side of the field. But you will see that safety come crashing into the screen at the last minute, unable to stop the touchdown pass. That’s because of Goff looking to the left side of the field, which prevented the safety from providing help over the middle. Goff quickly works through his progressions, senses the pressure and still has the ability to step into his throw and deliver a strike 25 yards down the field. While Goff’s arm strength will never be mistaken for Joe Flacco or Jay Cutler, we see here that he has plenty of strength to make all of the throws required in pro football. Notice that Goff is moving to his left — which is never easy for a right handed quarterback to do — and still has enough zip to complete a pass 25 yards down field. Plays often break down in the NFL, requiring a quarterback to improvise and deliver a ball from less than ideal positions. Goff flashes enough arm talent and strength to make those awkward throws. Despite all the talent in the world, Goff can be sporadic with his accuracy and short arm throws that lead to interceptions. I chalk this up to two issues. The first one I am reasonably confident in: Goff’s mechanics break down at times when facing pressure, leading to inaccurate throws or throws that lack power. The second one is more of a creeping suspicion, but it is the only explanation I can think of for when he miss-fires despite not being under pressure: Goff’s small hand sizes. Ideally, Golf would have his front shoulder facing his intended target and step through his throw towards his receiver. But if you look closely enough you can see that Golf’s body is parallel to the line of scrimmage when he releases the football. Inconsistent mechanics begets inconsistent results. But there are other times where Goff simply misses on passes despite having a clean pocket and no obvious problem with his mechanics. My best guess — and this is just a guess — is that Goff’s hand size is causing him problems. Goff’s hands measured at 9 inches at the NFL combine, causing a buzz on social media and among NFL teams. For those of you that think fixating on the difference between a 1/2 inch is silly, consider this: according to ESPN.com Insider, only 22 quarterbacks since 2008 — i.e., less than 10 percent of those at the combine — had hands that measured 9 inches or less. The only quarterback to have success as a start is Ryan Tannehill. Outside of that, the quarterbacks haven’t done much in the league. That ball just dies on him after about 15 yards, forcing the receiver to drop to the ground to make the catch. The larger the hand, the easier it is to grip the football, which in turn makes it easier to consistently deliver the ball with accuracy and power. I can’t say for sure that this is why Goff has a tendency to be off target or have passes die on him, but I think it is a reasonable conclusion based on the evidence before me. Two final issues that popped up in the tape: misdiagnosing Cover-2 schemes and issues with ball placement. I am not overly concerned about this — at least not yet — because it is likely something that can be ironed out over the course of his career. But it happened enough in his tape to warrant inclusion in the report. The last couple gifs are more examples of Goff struggling — at times — with his ball placement. This is an easy throw and catch, and one that Goff should be able to hit the receiver in stride with ease. But watch how the receiver has to lean back to catch the ball. This may seem like nitpicking, but in the NFL, quarterbacks need to be precise with their ball placement. Being off several inches can mean the difference between a touchdown and interception. So where does this leave us? Goff has all the tools in the world that you want in a franchise quarterback: good size, accurate arm, cerebral player, with functional mobility to boot. But Goff is not as consistent as some of the other elite quarterback prospects that have come along. Which is why I project that — if things pan out right — Goff will likely sit in the top 7-15 range of quarterbacks. Think Matt Ryan, Joe Flacco, and Eli Manning. So I wouldn’t mortgage the future to go get him at the top of the draft, but I would definitely target him from pick 5-10. My biggest concern with Goff is the obvious one: he played a fairly simplistic spread offense in college. What other QB has done well coming out of that type of system? In the Gruden QB Camp show with Goff, it was apparent he really knew the offense he ran, but how well will that translate? Derek Carr played in an air raid. Drew Brees was dinged for playing in an early version fo the spread. Mariotta played in a spread. Aaron Rodgers was slammed for playing in Tedfords version of the West Coast which was seen as a gimmicky bastardization of the WCO. Andy Dalton’s OC was Justin Fuente aka Paxton Lynch’s head coach at Memphis and runs a Power Spread. The scheme concerns are vastly overblown. The NFL far more resembles the spread and air raid offenses than the run the ball 50 times, throw 20 times (most of them PA) that Connor Cook or Kevin Hogan ran.